30 January 2009: The Republic of Bolivia is a landlocked country in South America. Its nine departments are divided into a varying number of provinces, which are subdivided into municipalities. The nine departments were granted increased autonomy in 1995 and further local government reforms were enacted in 2005 with the first direct elections for departmental governors. 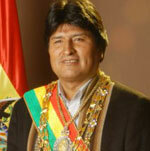 In December 2005, the socialist Evo Morales was elected president, Latin America’s first head of state from an indigenous background. Bolivia served as the interior region of Spain’s extensive colonies in South America, following the fall of the Inca Empire in 1533 at the hands of the European invaders. The administration of modern-day Bolivia, then known as Upper Peru, was organised under the Viceroyalty of Lima then the Viceroyalty of Peru. Upper Peru was then incorporated under the Viceroyalty of Rio de La Plata, which had its capital in Buenos Aires, which was run along highly-organised bureaucratic lines. In 1809 independence was proclaimed and, thanks to the invasion of Spain by Napoleon, achieved by 1825 with Upper Peru renamed Bolivia in honour of its liberator, Simon Bolivar. During 1836-1839, Bolivia was a member of the Confederacion Peru-Boliviana, but this ended when the two countries were defeated by Chile. Bolivia then ceded its coastline to Chile in 1883 following the War of the Pacific and its territorial integrity was compromised further by the loss of its lands to Brazil and Paraguay after further military defeats during the 20th century. Following the Chaco War of 1932-1935, Bolivia was gripped by political turmoil and crises of confidence in the ruling elite. The emergence of nationalism as a political force in Bolivia came about with the denial of the Revolutionary Nationalist Movement’s (Movimiento Nacionalista Revolucionario) 1951 presidential election victory which led to the revolution one year later. The MNR, under presidents Victor Paz Estenssoro and Hernan Siles Zuazo, introduced universal sufferage and nationalised the tin industry. After the 1964 coup, Bolivia experienced a number of weak, short-lived governments, along with successive coups and counter-coups on behalf of the military. Hugo Banzer, a rightist colonel and head of the education ministry, staged a successful ‘revolution’ in 1971 against the leftist coup which had taken power from him and his allies one year previously and he then held onto power for seven years, banning leftist parties and closing the universities. Elections held in 1978 were dismissed as being conducted under fraudulent conditions. The bloody coup of 1980 under General Luis Garcia Meza saw routine human rights abuses, though its alliance with drugs cartels led to ostracisation efforts by the US, with Hernan Siles Zuazo returning to office in 1982. A tin crisis and resurgence of the power of drugs lords, coupled with hyperinflation of 24,000% saw out the 1980s. Hugo Banzer was elected as the US-backed president in 1997 on behalf of the Nationalist Democratic Action (Accion Democrática Nacionalista) he had founded in 1979. Banzer resigned in office in 2001 after being diagnosed with cancer and was replaced by his deputy, Jorge Quiroga. During this time, Bolivia was rocked by a series of anti-privatisation protests, triggered by the sell-offs imposed by the World Bank and culiminating in the Cochabamba protests of 2000 that saw martial law imposed. In the 2002 presidential election, the US Ambassador commented that if Bolivians voted for the Movement Towards Socialism (Movimiento al Socialism) candidate Evo Morales it would cut-off foreign aid and cease trading. Morales then emerged as a leading candidate and though defeated in that election by the MNR’s Gonzalo Sanchez de Lozada, was elected president in 2005, following the Bolivian ‘Gas War’ which saw social movements protesting at the foreign ownership of the country’s considerable natural resources. Bolivia’s modern constitution was promulgated in 1967 and amended in 1994, with a strong executive presidency and a weaker bicameral Congress, which consists of the 130 seat Chamber of Deputies (Camara de Diputados, elected by proportional list and single-member divisions) and the 27 seat Senate (or Camara de Senadores, elected three senators per department). In 2007 a constituent assembly on the constitution convened by the MAS government of Evo Morales and boycotted by the opposition published an array of proposals to be set before the electorate in a referendum in 2008. While the draft constitution promised more autonomy for the regions, its "plurinational" element aimed at recognising equality between races fuelled regional tensions between the poorer indigenous regions of western Bolivia and the resource rich eastern regions. The proposals were actively contested by a number of departments and reignited the dispute between the rival cities of La Paz and Sucre as to which is the true capital of Bolivia (currently government functions are split between the two). The four natural gas rich departments in the east of the country then declared a form of independence from both the central government and the new constitution, citing alleged authoritarianism and racial discrimination of Morales' administration. In January 2008, the central and regional authorities concerned arrived at a delicate truce aimed at preserving national unity. This was later shattered by a virtual civil war in autumn 2008 following a rightist uprising in the east, in which government supporters and trade unionists were killed. The government expelled the US ambassador over his support for the rightists. The constitution was approved by voters in January 2009 however and will be ratified by parliament. If enacted it will not only strengthen the presidency to assert control over the economy but also decentralise power to the country's 320 municipalities. It will also allow for a smaller lower house of congress with an increased senate in order to rebalance the constitution. La Paz is the administrative capital of Bolivia, as well as the departmental capital of La Paz Department. As of the 2001 census, the city of La Paz had a population of about one million. La Paz is situated in the canyon of the Choqueyapu River below a plateau with an altitude of 3,600 meters. On top of the plateau is the city of El Alto, where the international airport is located. Its name is translated into English as 'The Peace' or 'peace'. Founded in 1548 by Alonso de Mendoza at the site of the Native American settlement called Chuquiago, the full name of the city was originally Nuestra Señora de La Paz (meaning Our Lady of Peace). The name commemorated the restoration of peace following the insurrection of Gonzalo Pizarro and fellow conquistadors two years earlier against Blasco Núñez Vela, the first viceroy of Peru. In 1825, after the decisive victory of the republicans at Ayacucho over the Spanish army in the course of the South American Wars of Independence, the city's full name was changed to La Paz de Ayacucho (meaning The Peace of Ayacucho). In 1898, La Paz was made the de facto seat of the national government, with Sucre remaining the nominal capital only. This change reflected the shift of the Bolivian economy away from the largely exhausted silver mines of Potosí to the exploitation of tin near Oruro, and resulting shifts in the distribution of economic and political power among various national elites. 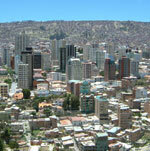 La Paz is the highest capital city in the world.